Integrate zlien with your your RedTeam account to save time with generating, tracking, and collecting lien waivers. Ensure that you are logged into both your zlien and RedTeam account. From the “Apps” tab in your RedTeam account, find zlien on your list of apps and click Connect. To sync a project from RedTeam to zlien, go to the Scope tab of that project. Click Edit. Scroll down to the “zlien Preferences” section. Check off the “Send Project to zlien” box and fill out all fields in the zlien Preferences section. Click Save to import this job into zlien. 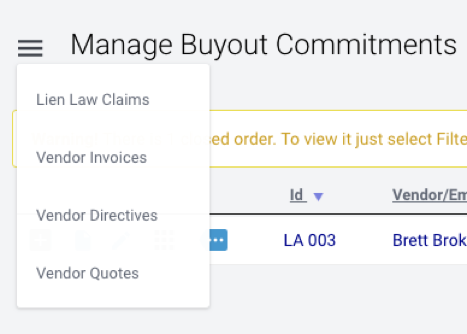 To start requesting waivers through zlien, go to the Buyout section of the project. Click the house menu icon and select Vendor Invoices. Select the invoice that you would like to send a waiver on and click Edit. On Step 4 of the invoice (Lien Waivers) you will see the claimant listed and the option under the Action column to Request a Waiver. (Look for the blue Z logo!) Click the Request button. Helpful Hint: If you don’t see the Request Waiver option, you may need to add your Subcontractor as a Claimant. Contact RedTeam support to get this set up. A window will appear where you can fill in the details of the lien waiver, including what type of waiver you need and which waiver template you would like to use. Confirm the claimant’s email address and other fields that are required on the waiver. Then click Send Request to email the waiver to your subcontractor. Helpful Hint: You can set up your own waiver templates in zlien, or use our default statutory forms. Click here for instructions on setting up your own custom templates. You can track the status of the requested lien waiver in your zlien account, under Documents > Requests. Helpful Hint: Your recipient will be prompted to e-sign the waiver (or print it and get it notarized, if you require notarization on lien waivers). Click here for a video of the recipient experience and what it looks like when waivers are returned as signed.